San Francisco’s high and mighty are in full-throated self-celebration of the city’s “rising from the ashes” of the April 18, 1906, earthquake and fire. Forgotten are people like my great-great grandfather Lee Bo-wen who immigrated to San Francisco Chinatown in 1854 and reared two generations at 820 Dupont Street. My whole family was forcibly evacuated, never to return. Even Dupont Street itself vanished forever, as post-disaster faux Chinese architecture buried the people’s Chinatown and made its successor, the now famous Grant Avenue, the centerpiece of the city’s newly minted Chinese tourist industry. Indeed the same scandalous profiteering, racism, incompetence and mendacity that have characterized the response to Katrina had an antecedent in the San Francisco earthquake and fire of 1906. It is now fully documented that during and after the 1906 disaster, developers, insurance companies, corporations led by the Southern Pacific railroad, city leaders, newspapers and Army brass shamelessly lied and promoted anti-Chinese racism to downplay and distort the disaster in order to advance their own selfish agendas. Authorities claimed that only 300 people had died, the better to undercut claims against the city and the business community. It took decades of painstaking documentation by Gladys Hansen, the city’s archivist, to prove that in fact more than 3,000 had died. The Army and the police blamed their failure to control the fire on a lack of water. Later it was proved that this was a bald-faced fabrication. Water was plentiful: the problem was that the city and the Army grossly failed to mobilize enough manpower to pump the water and fight the fire. Meanwhile insurance companies paid up to $15,000 per photo — real or falsified — that could “prove” that a building was damaged by the earthquake rather than the fire, because they were not required to pay for earthquake damage. Businesses and building owners countered with massive arson in order to collect on fire insurance. And everyone from the mayor to labor leaders promoted gross racism in order to justify their attempt to grab the prime real estate upon which 25,000 Chinese lived. At the same time, the police and National Guard were unleashed against any Chinese suspected of looting. Historian Connie Young Yu’s grandfather, Lee Yoke Suey, was suspected of looting in his own store and bayoneted. A white crowd stoned to death a young man who was trying to salvage items from his home. Chinese refugees quickly flooded relief camps in San Francisco, Alameda and Oakland. As the Chinese exited Chinatown, city officials sought to prevent them from returning. A committee of top leaders was quickly established that focused exclusively on the permanent relocation of the Chinese, finally settling upon Hunter’s Point as a likely new location. But for the active fight waged by the Chinese community and actively supported by the Chinese consulate, this racist prediction might have been fulfilled. The San Francisco Examiner reported, “The committee’s protestations that what it intends is for the benefit of the Chinese is received with suspicion on the part of the Chinese.” In fact, few Chinese voluntarily took advantage of relief help when they discovered it meant being held as virtual prisoners in squalid, segregated camps. Despite their estimated population of 60,000, only 186 Chinese refugees remained at the Fort Point camp by May 8. The Chinese government’s consulate also made clear its intention to rebuild on its property in San Francisco Chinatown and to protect the rights of overseas Chinese. Although many Chinese residents were never able to return, the power elite’s plan to destroy Chinatown was foiled by a combination of Chinese resistance and the city’s desire for Chinatown taxes. That latter desire merged with the interests of Chinese merchants in shaping the new Chinatown around a tourist theme park. But at least Chinatown was saved for many of its residents. To frustrate Oakland’s racist red-liners, my great-great grandfather anglicized his name from Lee Bo-wen to Lee Bowen and was thereby able to record his purchase of a home in what was then the segregated, lily-white Fruitvale district. Thousands of other Chinese took advantage of the destruction of San Francisco’s records to claim U.S. citizenship. It should be crystal clear that disasters are not purely natural events: they can be caused or seriously aggravated by human action like global warming, racism, poor city planning, economic inequality, incompetence, greed, politics and war. When a disaster like the San Francisco earthquake or Katrina hits, your average person empathizes with the appalling loss and pain of the victims, and joins in to help by volunteering with rescue and reconstruction efforts, contributing money or any number of other humanitarian acts. Disasters not only reveal hidden inequalities but also grossly aggravate the existing power imbalances between rich and poor, between white and non-white. The power elite has usually planned ahead for disaster, suffers less and recovers faster from the shock. They have lawyers, bankers and politicians ready to fight for their interests. For most of us, the most vital response to natural disasters — before, during and after the event — is organizing our communities and workplaces to survive, rebuild and fight for our interests against the predators in our midst. In areas susceptible to disaster, it is critical to integrate disaster planning into our day to day organizing against gentrification and for social justice. And of course the fight in the Gulf region is still at fever pitch. It is crucial to support the fight to prevent the transformation of New Orleans from a largely Black working-class city into a gentrified theme park featuring jazz, creole food and gambling. Bob Wing is an Oakland/Bay Area based activist and writer. Thanks to Connie Young Yu, Nicole Derse, Donna Linden, Richard Marquez, Jane Kim and David Ho for organizing the “Ruin, Rubble and Race” symposium in San Francisco that inspired and informed this article. 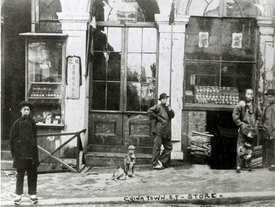 In commemoration of the Centennial of the 1906 Great Quake and Fire, the Chinese Historical Society of America (CHSA) presents “Earthquake: The Chinatown Story,” an exhibition sharing the Chinese experience during and after the disaster of 1906, a pivotal point in Chinese American history. The exhibit will highlight several untold stories of Chinatown quake survivors, such as a young American-born Chinese boy who was bayoneted as he attempted to retrieve his birth certificate from his home, a 7-year-old girl fleeing the fire with her family from Chinatown, and Superintendent Carrie Davis’ account of evacuating Chinese orphans from the Oriental Home. Items in the exhibit include photos of Chinatown before the quake, historical documents, and newspaper articles about how the small enclave was destroyed by the quake and fire. Visitors will also learn about attempts to relocate Chinatown from its current location, and about changes to Chinatown’s landscape after 1906. Hours: Tuesday-Friday, noon to 5 p.m. weekends noon to 4 p.m. closed Mondays Exhibit runs through the end of the year. Admission: $3 for adults, $2 for students and seniors. $1 for children 6-17 and free for CHSA members and children under 5. Free the first Thursday of the month.